I've been reading a lot of Space Wolves novels lately, most recently 'Battle of the Fang', which was absolutely brilliant! Anyhoo, all that primal sci-fi slaughter really got me in the mood for a Space Wolves army, so i jumped on eBay and grabbed me a couple of Grey Hunter Squads! 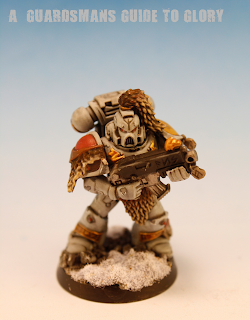 I went with a Space Wolves Grey undercoat (duh) which gave it a nice 'classic wolves' look; I wanted them to look as frosty as their home world! I did buy a tin of Army Painters 'Wolf Grey', but it was about the same colour as GW's 'Regal Blue', so was rendered useless as it was far to dark! As for army lists, here it is! Looks like it'll be a pretty fun list to play! I'm really looking forward to getting this army knocked out and having a few games with it! It'll help with the monotony of dry brushing a massive cathedral as well! Not a lot has been going on with the Cathedral in the last week or so, but today saw the front door fitted! I'm very pleased with it! As you can see, i used the wall panels of the Aquila set to fill the gaps around the sides of the door. It finished it off nicely! So while i was in the mood, i got the whole thing undercoated! For this i used Army Painters Uniform Grey - of which i used most of the tin!! I didn't apply a solid colour on the base, as i wanted to keep a bit of the dark lino colour to add a bit of depth. Now I've got to dry brush the WHOLE thing! Now this will take a bit of time! Its been a few days since anythings happened to the Cathedral, but theres a bit to report today! Its taken me AGES to get the final window panels cast and tidied up! But today that's was done, and the towers are now complete! I have to say, its starting to look quite magnificent! Its size now dwarfs my Reaver Titan, Praetorian! I'm still to make any headway on the front door, but that's because I've been toying with other ways to construct it. However, I've come back to my original idea of using the Shrine of the Aquila which I'll probably purchase next week. So what now? I think its time to start painting! I'm leaving the rest of the flying buttresses off for the moment, as i think that will make painting the super-structure a bit easier. I'm just going to undercoat it and do the bulk of the dry brushing, then I'll add the buttresses. I hope to get this done by the end of the week! After a long day of casting and assembling, the third floor is now in place! This thing is starting to look impressive! A few Helpful volunteers from the Vostroyan Firstborn to show off the scale! As this thing gets bigger I'm starting to think a bit more about the interior. As i mentioned in the last post, i wanted to have the interior balconies supported by pillars. HOWEVER, after doing a quick mock up of that idea today, it seems that this will severely restrict the playing space on the ground floor if i did. Once i have the front door sorted, I'll be thinking about constructing the balconies. I'll have to think of another way of supporting the upper galleries, probably some sort of stylised support/girder! Then its painting - and that will be the hard part! This is what I've been working on while i was waiting for some supplies to arrive for the Cathedral project. This is what makes the Krieg the Krieg - Artillery! Theres going to be another Heavy Mortar added to A-Battery, but i have plans for that model later in the year, and there'd be no point in repainting it yet! Oooooo mysterious! More parts for the Cathedral have now arrived, so work is moving forward again. As a result I'm a bit behind, but they'll be more news on it for Friday! The ground floor has been secured to the base, and the second floor is on its way up! I was hoping to get some more parts in the post on Saturday morning, but alas, Royal Mail failed me! So until said parts arrive, the second floor will remain half done. With any luck I'll have them by the end of today/tomorrow. In the meantime, I've drawn up a rough plan (a very rough plan!) of what i want to put inside. Forgive the graphics, MS Paint hasn't seemed to have evolved since the 90's! Basically the red rectangles are going to be balconies with spiral staircases for access. Theres an alter at the back, and the long green area will be reserved for the aisle. Pues will run off the sides of the aisle space, both ruined ones and in tact ones. As for the roof - well now I've decided to have a partial, ruined roof. Mainly because i thought that taking the roof on and off several times a game would quickly become a pain! This next scale shot is here for the benefit of 'The Inner Geek', who wanted to know how big the cobblestones were on the lino base. Well, as you can see, they're quite a bit bigger than cobblestones and are more like crazy-paving!! Whatever it looks like, it looks great for this scale of war gaming! So without parts for the Cathedral, I've been killing time by painting up a Death Korps Heavy Mortar Battery as part of the Krieg repaint. I'm nearly done with that, so I'll present that in the next post!